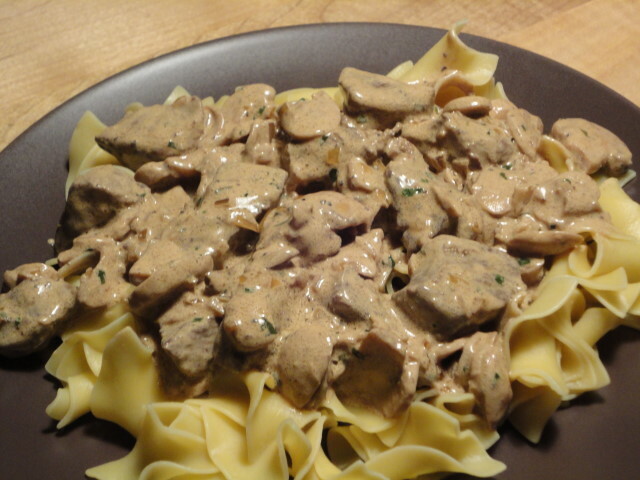 I’ll be honest: I can’t remember that last time that I had Beef Stroganoff. I suppose I may have a bad—or at least mediocre—memory of it. Anyway, it wasn’t even on my cooking radar until a friend of mine suggested it. Several times. 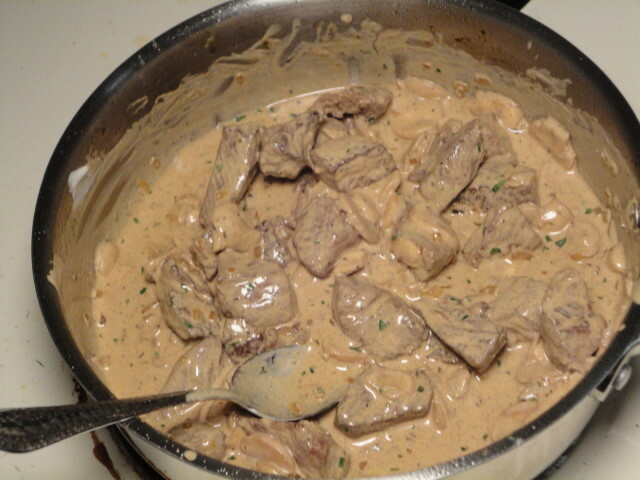 If you don’t know, Beef Stroganoff is a stew of chopped up beef in a sour cream-based sauce. Or that’s how I’m going to play it for this post. This is not my recipe, I got it from the good folks at Simply Recipes. The reason I chose this one is because it was quick. You can cook Beef Stroganoff in a completely different, and longer, way. That will have to be another post. Because this is not my recipe, I’ll leave you to go look at the original and just walk you through my implementation. Before I even started, I cooked my egg noodles. This recipe can be served over several different starches. Apparently, the traditional one was thinly cut potatoes, which is quite intriguing. The first step on the recipe is to cut the beef into strips. I opted to buy beef that was cut into cubes for stew. I would actually recommend the strips, or at least cutting the cubes into thinner pieces. 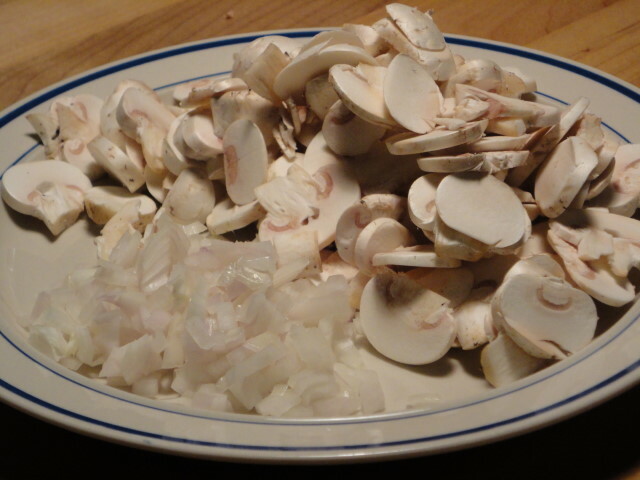 With my beef cubes at the ready, I chopped the shallots and mushrooms. 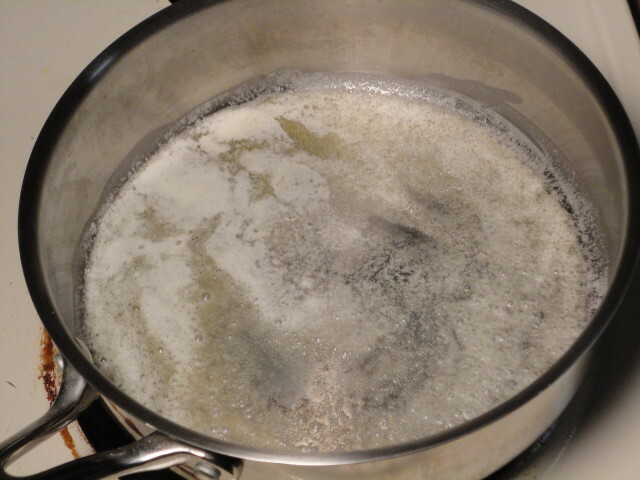 Next, I melted half of the butter in a pan over medium heat. 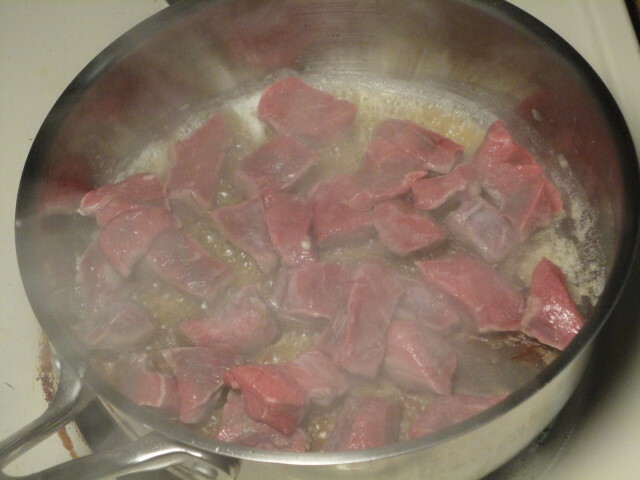 I then turned up the heat to medium-high and added the beef. Add salt and pepper to taste. The beef might stick to the pan at first, if you’re not using a non-stick pan. It’s okay, don’t freak out. Just wait a minute and then stir them around. I made sure that the beef was browned on all sides and then removed it from the pan. This left quite a mess in the bottom of the pan. Don’t be tempted to clean the pan! That brown mess is what will help flavor your sauce. Next, I turned the heat down to medium and sauteed the shallots in the same pan. You don’t want to brown the shallots, just cook them until they look translucent. I removed the shallots from the pan and set them aside. Keep an eye on them and stir them occasionally, and they should be done after 3-4 minutes. Cooking the mushrooms really cleaned up the brown mess in the pan. This is called deglazing. 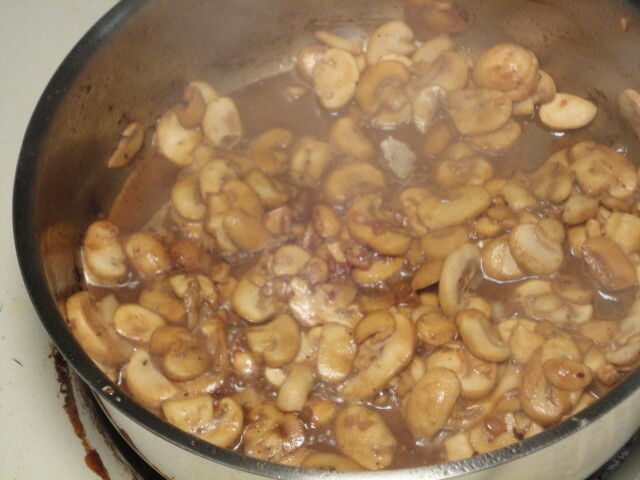 Mushrooms release a lot of liquid, which you’ll notice will mix with the beef drippings in the pan to start creating a sauce. Next I reduced the heat to low and added the sour cream. I added a little more sour cream than the recipe called for because I wanted more sauce. 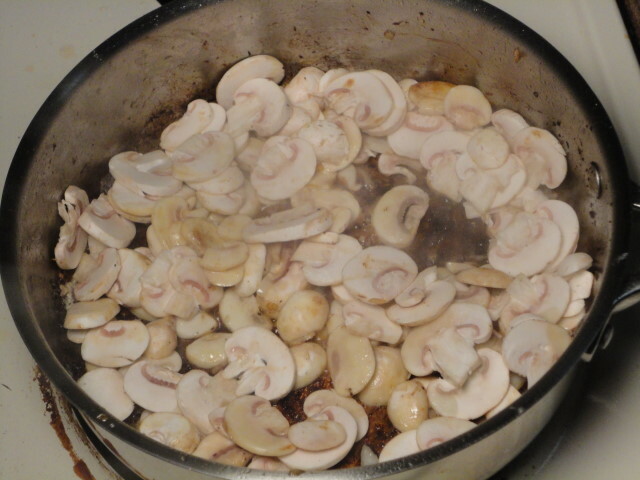 Once I mixed the sour cream into the mushrooms, I added the shallots and beef. And that’s Beef Stroganoff! I’m sure that someone out there will compare this to their Russian grandmother’s recipe and scoff, but it was excellent served over rice noodles. I can’t wait to try this recipe again!